This is my second car I’ve got from Walters and I’ll never go to another Mercedes dealership. The staff is friendly and always welcomes you and makes you feel like family. if you’re getting your car serviced , they’re always pretty quick and always have a loaner car ready for you . 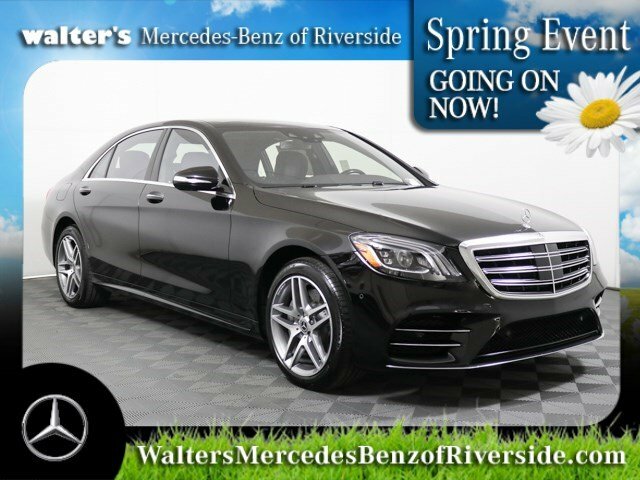 I’ve never had a bad experience here over the last 3 years and would highly recommend this dealership to anyone interested in getting a Mercedes . Ask for Morris Gaines and he will help you with anything you need . Ryan was helpful answered all my questions!He is the reason I will buy a car. Overall good experience and Ryan was very knowledgeable and exceeded my expectations! I have been here a few times and have always been treated well.. I owned a C250 and anytime I had to get service or warranty work I would bring it in and they would treat me in a very polite and professional manner.. I was in the market for a gla 45amg model at one point and even though I didn't purchase I did want to thank Ryan Dunahoe for his excellent skills in customer service. He stood out more than the average salesman and I appreciated every moment working with him. Thanks again. New vehicle pricing includes all offers. Tax, Title and Tags not included in vehicle prices shown and must be paid by the purchaser. While great effort is made to ensure the accuracy of the information on this site, errors do occur so please verify information with a customer service rep. This is easily done by calling us at 888-347-1436 or by visiting us at the dealership. With a biturbo V 8 and self-leveling air suspension, the S 560 takes to any road with an elegant air of authority. Industry-advancing luxury and safety offer comforts on the deepest level, for all of your senses. With its ideal proportions and distinctive details, the S-Class is at once majestic and athletic. From the double chrome bars in its grille and elegant front apron, to its strong rear shoulders, it clearly conveys the power and strength within. Yet its subtleties are just as compelling. Its unusually crisp body creases, impossibly tight tolerances and intriguing LED illumination make it the embodiment of confident elegance and the advancement of a rich tradition. While the palatial S-Class cabin is overflowing with advanced technology, timeless and thoughtful attention to detail ensures that it's never overwhelming. Extensive hand-tailoring of the leather, with an abundance of precisely topstitched upholstery on virtually every surface, teams with a tantalizing array of exotic, handcrafted wood trim options and aluminum accents. The net effect envelops the occupants in a sense of time well spent, both in its craftsmanship and your enjoyment of it. The first car without a single lightbulb since the advent of electric lighting in automobiles, the S-Class advances its technology with bold style. From its headlamps and triple-band LED Daytime Running Lamps to its three-segment vertical taillamps with intriguing Stardust technology, long-lasting and energy-efficient LEDs accomplish every exterior lighting function. LEDs also offer quicker illumination, offering other drivers more time to react to your brake lamps and other signals. Advanced performance comes from a higher-output yet more compact 4.0L biturbo V 8. With 463 hp, it's more powerful than its predecessor, matches its 516 lb-ft of peak torque and outperforms it in both responsiveness and responsibility. Racing-derived technology ranges from its turbocharger layout to its low-friction NANOSLIDE(R) cylinder walls. And its high-pressure Direct Injection and rapid-multispark ignition can self-tune on the fly with millisecond speed and molecular precision. With a greater range of ratios and shorter steps between gears, the 9-speed automatic changes gears more quickly but nearly imperceptibly. Along with a more seamless delivery of power, the lighter, more versatile transmission enhances quiet riding comfort and fuel-efficiency. The electronic selector and shift paddles let you control all gear changes with your hands on the steering wheel. And drivers can vary the shift modes via the innovative DYNAMIC SELECT system. A multimode drive program selector on the console lets you transform the car's character with the flip of a switch. Three modes (Comfort, ECO and Sport) alter the throttle response, shift points and steering effort and ECO Start/Stop. A fourth Individual mode allows you to create a mode of your own, even letting you set the transmission for purely manual shifting. A crisp, high-resolution screen uses a high pixel count, a fast refresh rate and automatic adjustment to ambient light to provide seamless display of entertainment, navigation, comfort and convenience features and customizable vehicle settings. Linear-style menus are more intuitive and offer easy access via the touchpad controller on the console or the right-hand Touch Control Buttons on the steering wheel. In addition to the 12.3-inch central display, a second 12.3-inch screen is placed directly in front of the driver and seamlessly integrated within the same sleek panel. Its customizable displays include instrumentation and a large multifunction menu screen with illustrated and animated menus for vehicle information, settings and driver-assistance features. A number of instrumentation styles can be selected, featuring a variety of analog-style, digital and graphical readouts. The Cockpit Management and Data (COMAND®(R)) system offers intuitive access to a world of entertainment, navigation and convenience. The central controller falls naturally to hand, teaming an intuitive touchpad with a rotary knob and one-touch keys for major functions. The touchpad responds to a variety of finger motions, including swipe, pinch and even handwriting. Intuitive on-screen menus help make adjustment of the car's abundant features logical and easy. In the future, cars will be able to communicate with each other over the airwaves. The future starts today. With its industry-leading Car-to-X Communication, every new S-Class can automatically alert a central notification system of certain dangers, from detected wheelspin to the use of hazard flashers or even windshield wipers. The system can then alert other drivers with Car-to-X via in-dash displays or announcements, allowing precautions to be taken before reaching the hazard. Radar-based technology can alert you if you're approaching a vehicle ahead, or even some stationary objects, at a speed and distance that suggest a collision is likely. As soon as you start to brake, it can automatically provide an appropriate level of braking to help prevent a collision or reduce its severity. If you fail to respond, it can also initiate braking automatically at a range of driving speeds. The system can also detect and react to crossing pedestrians at typical city speeds. The first system of its kind, ATTENTION ASSIST®(R) continuously monitors up to 70 parameters of driving behavior and can automatically alert the driver with both visual and audible warnings if it detects signs of drowsiness on long trips. With enhanced sensitivity, the system can also help detect drivers who begin their trip drowsy and offer more useful information to drivers along their journey via a dashboard display. 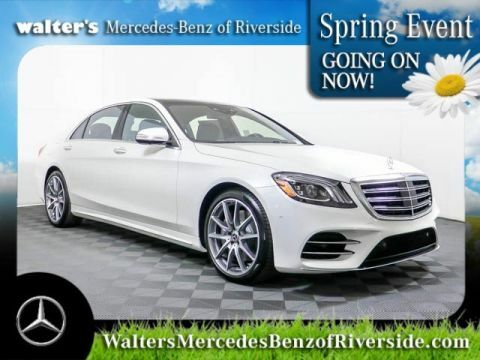 Let the 2019 Mercedes-Benz S 560 impress you in person today at Walter's Mercedes-Benz of Riverside located at 3213 Adams St. Riverside, CA 92504. The Mercedes-Benz brand is defined by impeccable style, uncompromising performance, and sophisticated luxury. The best Mercedes-Benz dealerships are defined by extensive selection, unwavering service, and a superior car buying experience. 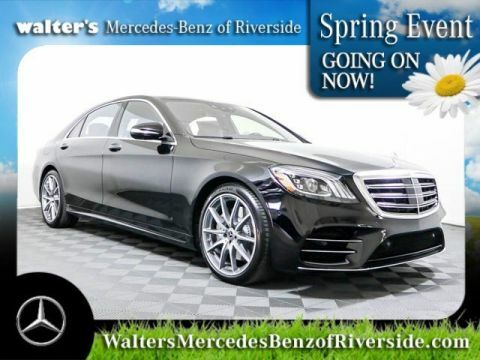 When you want to shop for the best vehicles at an amazing dealership, come to Walter’s Automotive. For more than 50 years our family owned and operated business has been serving all the needs of luxury car buyers in Inland Empire, Orange County, Moreno Valley, Corona, and San Bernardino. That experience and expertise allows us to deliver a truly refined dealership experience in Riverside where the lower cost of doing business gets you a great price!